Traditional psychodynamic therapy is often caricatured as endless, with a complacent therapist silently growing cobwebs, listening to a patient who never plans to leave. This isn’t completely unfounded: there are therapeutic advantages to losing track of time, “swimming in the material,” and letting one’s therapeutic focus be broad. The patient’s chief complaint, i.e., the ostensible reason for coming, often gives way to more troubling underlying conflicts and concerns that might never appear in more directed or time-limited work. Highly defended material may be uncovered and worked through in the fullness of time. All the same, and as many critics have pointed out, this is a cozy arrangement. If the therapist is happy to have a paid hour, and the patient is gratified to pay for the undivided attention of a caring doctor, nothing need change. Ever. 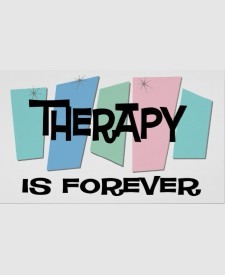 Many patients fear becoming emotionally dependent on their therapists, i.e., finding it too comfortable to stop. And some therapists, being human, are not above maintaining a pleasant status quo. Psychoanalysts and analytic psychotherapists anticipate this concern, and hold that a patient’s dependency, like everything else, can be explored, understood, and overcome. However, in highly non-directive therapy, i.e., with a mostly silent therapist, this can take a long time and be painful for the patient in the meantime. My approach to dynamic work is more interactive. While I believe transference and countertransference are highly useful tools, and that both manifest and latent content are important, I also strive to help paients in the here and now, whenever doing so doesn’t interfere with long-term gains. In this light, I often tell patients that I aim to make myself obsolete in their lives. Saying this can quell dependency fears, but it’s open-ended enough that I’m not promising how long (or briefly) we’ll work together, nor that I guarantee they won’t feel dependent along the way. I can’t promise these, because I don’t know. But I can give my word that I won’t allow myself to get so comfortable with our arrangement that I forget why we’re meeting at all. It’s a comforting statement that has the advantage of being true. It feels good to have a patient not need me anymore, a little like the bittersweet feeling when a child goes off to college. And in a way, hearing myself say so out loud helps me remember it. The trade-off, a psychoanalyst might point out, is that I short-circuit any fantasies patients might harbor that I seek to trap them, that I want them to feel dependent. Patients might gain more insight about themselves if I let such fantasies germinate, and then collaboratively explore them. It’s an important point to keep in mind, but on balance I usually feel this modest bit of support helps the therapeutic alliance much more than it forestalls exploration. A successful psychotherapy is when a patient leaves with the satisfaction that she “got what she came for,” and no longer needs, or even wants, to see a therapist. And a successful psychotherapy practice is one where patients come (in need) and go (improved), the therapist becoming obsolete one patient at a time. I think I understand what you are saying, yet I am confused about the termination aspect of psychotherapy. Is it when the patient has resolved all of the issues they wish to, or is when they have mastered enough of their issues that they have then learned how to resolve the rest of them themselves? And, only somewhat OT. What is it with the continuation of CBT through monthly, every few months or a couple of times a year sessions after the initial therapy? I find it curious to read of a limited time-frame for psychotherapy being discussed while the timing of CBT is being increased. Of all therapies, I would think CBT would be self-limited. Except of course, if you are paying for a friend. When to end treatment varies by the type of psychotherapy, and by whatever both parties decide. Traditionally, the goal of psychoanalysis was to “fully analyze” the patient. I’m not an analyst, but I understand this to mean working through all major unconscious conflicts. It’s an ambitious goal that I imagine is observed more in the breach. Freud and his followers recognized that even this wouldn’t guarantee happiness or a problem-free life; life still throws curveballs. But I believe the idea is that future issues would not be sustained by unconscious conflict, and thus could be resolved without further assistance. Anything short of psychoanalysis doesn’t aim for mastery of all emotional issues, now and in the future. Open-ended dynamic psychotherapy (slightly) less ambitiously hopes to help resolve all current issues by addressing their unconscious mechanisms. This certainly includes all the issues that led the patient to treatment, and even issues the patient didn’t consciously seek to resolve when he or she started. Time-limited therapies, whether dynamic or cognitive, have more limited goals, usually to relieve one or a small number of presenting complaints or issues. Their time-limited nature often means starting a process that continues to foster improvement after the therapy ends. Regarding your other question, “booster” or “check-in” sessions are not uncommon in both CBT and dynamic therapy. They are probably easier to justify in the former, where the treatment paradigm is learning to change one’s cognitions. There’s nothing wrong with a little “continuing education,” is there? In dynamic therapy, periodic check-ins may mean the therapy ended prematurely, that there are unresolved dependency issues, or that the meetings are primarily supportive in nature (which is sometimes useful and good). Or, as in my post, the arrangement could be comfortable but fundamentally unhelpful, and worth a second look. Thanks for writing. I read with much interest your posts about transference and counter-transference, which you briefly mention here as well. I would really like to explore transference as I have experienced it often throughout my years of therapy. I began to explore it with one therapist but fell short when I moved to another city. I am currently experiencing quite strong transference but I have a dilemma: the therapist is a couples therapist whom I see with my partner, I am not ready to disclose transference to my partner, but I would like to explore transference with the therapist in question rather than another. Do you have any thoughts on this? Thank you, AK. Transference is typically explored in individual dynamic therapy or psychoanalysis. But it doesn’t have to be. “Group relations conferences” in the tradition of the Tavistock Institute in London explore transference in groups. Transference can be explored in couples therapy as well. In this setting the aim of such exploration is to shed light on the relationship of the couple. For example, if one member of the couple assumes putative helpers are actually withholding and uncaring, this may appear more visibly in transference to the therapist, and only more subtly in relation to his or her partner. A dynamically oriented couples therapist may highlight or interpret such a transference, and then wonder aloud whether it colors the couple’s relationship. Of course, a sensitive therapist gauges how uncomfortable this kind of observation would be, and may offer it, or not, accordingly. The couple themselves can steer the discussion toward or away from transference as well, so if you feel your “quite strong transference” reflects on your relationship with your partner, it’s certainly fair game if you care to bring it up. Thanks for writing. Good morning. I wrote you once previously and found your discussion to be quite helpful. Despite being quite close to a mutually agreeable terminating point not that long ago, something changed in my life that has caused me to feel very unsettled. I know some of the factors are related to changes at my work environment (usually the place that gives me the most balance) but some also seem heavily weighted toward my ongoing therapy (or at least that is where I often feel compelled to place the “blame”). I am certainly not feeling hopeless but do rather dislike the unpleasant feelings that seem to be ongoing related to therapy disclosures on my part. I so want to be able to understand why am feeling what I am, but at the same time, would rather not feel this way at all. Had I to hazard a guess, these feelings are related to transference? I’ve often thought transference was more what I projected onto others from my past, or even related to my curiosity of others (not simply in therapy setting), but am thinking that my understanding is incomplete. I would imagine my therapist will encourage me to continue to explore my feelings as she had said that I am making progress. Problem with me is that I feel just the opposite – as if I am spinning my wheels with nothing tangible to show for my efforts. Good evening. I so want to be able to understand why am feeling what I am, but at the same time, would rather not feel this way at all. I often remind patients that we cannot directly choose our feelings. Feelings come of their own accord. Indirectly we can discourage some feelings, and encourage others, by creating or entering into contexts in which unwanted feelings are less apt to occur. E.g., tense frustration is less likely in a quiet park than in a traffic jam. Guided imagery can create an analogous context “internally.” Cognitive therapy is based on the idea that changing one’s conscious thoughts indirectly improves feelings and mood. And psychodynamic therapy and psychoanalysis are based on the idea that a trusted helping relationship plus insight — making the unconscious conscious, and gaining a deeper and more nuanced appreciation of one’s own feelings — influence feelings indirectly yet profoundly. Just as you’d avoid frustration-inducing traffic jams, your wish to avoid a context that fosters a “very unsettled” feeling is entirely natural. However, the psychotherapy office is also where you may gain insight, and thus be relieved of this feeling in the future and in different contexts. So it’s a trade-off and a gamble: will the discomfort lead to lasting improvement? is it worth it? No one can say but you; even your therapist can’t guarantee an outcome. Your unpleasant feelings may be transferential, but I can’t say from here. Your mention that your feeling may be related to what you disclose is a hint in that direction, and its appearance shortly after nearly terminating treatment suggests other avenues of inquiry. I assume your therapist will encourage you to continue to explore your feelings, just as you predict. We therapists almost always do that in the setting of an unexplained, unsettled, unpleasant feeling. It’s our job to help feelings become explained, settled, and pleasant (more or less) — and yours to decide if you’d like to spend time, money, and often some emotional discomfort to that end. Thanks again for writing. You are fostering dependency by not actively helping your patients define goals for themselves and how to achieve them. You make yourself a statue to them rather than an active participant. You allow them to stay on with you and are flattered that they like you so much. You frequently have phone secessions outside of regular therapy secessions to take advantage of your patients for your own personal gain.Let’s face it, you are the neurotic and narristic therapist who really needs more help than your patient. Finally, you, without warning, tell your patient that they can live without you. You deserve the same treatment and I hope you get it someday. Whenever I receive a comment like this, I wonder whether the writer even read what I wrote. Maybe it’s just a random rant, aimed at no one in particular. My post argued against being a “statue”, against unexamined dependency, and for being an active participant. I rarely have phone sessions. I’m sorry you’re so angry, but it doesn’t seem to be at me. Hope you feel better soon. I’m seeing a psychologist who I’ve developed an attachment to. In feeling such a thing, all of my intimate relationship issues have come bursting out in therapy – directed square at them – as I’m sensitive to anything they say or do being a sign of rejection or abandonment. Lucky them, they get to see a direct view of my worst sides! With this attachment has come a desire to be dependant on them, while I don’t want to cross any boundaries either. This is a first for me; I believe I have a dead mother complex; all my previous therapists were female and transference issues were never present, unless total absence can be considered one! All this to say that I feel like the only way through my issues is through feeling a safe level of dependence to a healthy example, but I get the feeling my therapist doesn’t want anything to do with such a thing and it feels re-traumatizing. I could understand, but simultaneously I don’t know how to feel safe within the therapeutic boundaries anymore due to my attachment and their reactions causing constant fears being triggered, and then causing routine ruptures (not unlike my intimate relationship patterns). I constantly take their avoidance and shifting of boundaries to be a covert message that my feelings aren’t okay to/with them; it conflicts with the message that they do care, which I’m not use to caring about in therapy myself. I wonder what the psychodynamic/analysis would say about my desires. Is it completely unrealistic to think that the way through attachment issues would involve attachment in a safe environment with the intent to foster independence, not unlike the young child who looks to their parent when they’ve toddled off too far? Perhaps my fantasies are completely excessive, or I should just go back to a female therapist and give up on my love life completely. It should be entirely acceptable to your psychologist that you feel dependent on him. He should support your discussion of these feelings, to the extent you are comfortable sharing them. While it is not helpful for a therapist to create or foster dependency, it can be equally unhelpful to ignore or deny it if it is there. How much to encourage this exploration depends on your tolerance, not your therapist’s. That is, if focusing on your dependency causes panic, suicidal feelings, etc., the therapist should ground the discussion in a more pragmatic, down-to-earth direction, to help you maintain emotional control. In this way the therapist can help you feel safe while expressing “dependence to a healthy example.” The ultimate goal, as described above in my blog post, is not to maintain dependency but to outgrow it. However, first it must be acknowledged and understood. While it’s unpleasant (to say the least) to feel triggered, rejected, or abandoned, it is also survivable in a healthy therapy relationship. And therapy is the best place to take note of such feelings and overcome them. In case it isn’t obvious, there’s a big difference between having and discussing feelings in therapy, versus acting on them. While some non-dynamic therapists aim to gratify clients’ needs, including dependency needs, by catering to those needs, dynamic therapists believe more is gained by maintaining a relative neutrality of behavior. Not cold or unfeeling, but not the answer to all of the client’s dreams and desires either. This helps a client “feel safe within therapeutic boundaries” and encourages reflection. Thanks for writing.